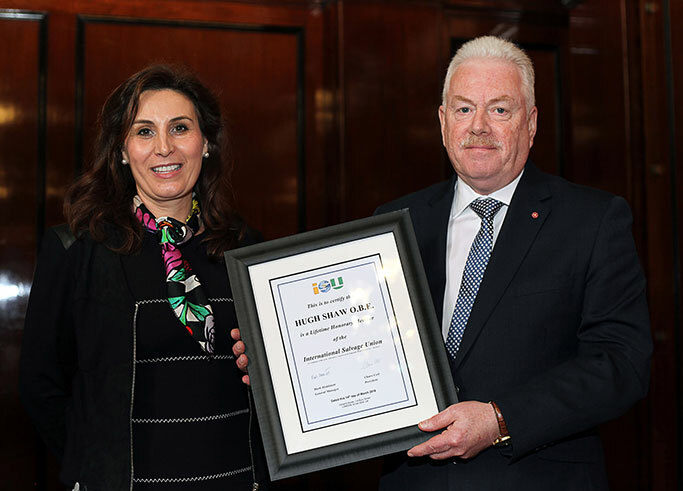 The International Salvage Union has awarded honorary life membership to Hugh Shaw OBE, the former UK Secretary of State’s Representative for Marine Salvage and Intervention. At the same time Mr Shaw was also awarded the ISU’s Meritorious Service Award. “Today we are making the rare award of Honorary Membership of the International Salvage Union to Hugh Shaw. Hugh has been a great supporter of the worldwide salvage industry and a friend of ISU for many years. His record as UK SOSREP – carefully and wisely managing hundreds of incidents – speaks for itself. His work has been recognised by the Queen with the award of the O.B.E. The fact that the general public do not know Mr Shaw shows how effective he has been: one mis-managed case and he would be very well known for the wrong reasons.